McKillen eventually left Northern Ireland for Dublin, Ireland, where she attended art school. She then moved to Los Angeles, where McKillen’s made her home since 1989. She doesn’t attend Mass much anymore, and she and her Jewish husband did not raise their son Catholic, but she still prays daily. “You can’t take the Catholic out of me,” she says. Because she viewed the church as a safe place full of beauty and peace, McKillen was deeply upset when news came out in the 1990s that Irish priests had been sexually abusing children for decades. The stories broke her heart. She couldn’t stop thinking about the victims, the children whose lives were shattered. The artwork McKillen created in order to give voice to those children is now the subject of an exquisite new exhibit at the Laband Art Gallery at Loyola Marymount University. Confess: An Installation by Trina McKillen opens on the campus of the Catholic school this Saturday, January 19, and runs through March 23. For a long time, McKillen’s art was rooted in photography. But when she was in her early 40s, she experienced a personal health crisis that led to a reevaluation of her practice. Frightened that she might not survive a cancer scare, McKillen reexamined how, why, and what she created. And so McKillen collected tiny scraps of Irish linen and began to sew them into small rectangular squares. At the time, she wasn’t sure why she was doing this or what exactly she was making. McKillen took a plastic bag full of these little linen squares with her to Ireland on a trip to visit her parents. Her dad was curious: What are they for? Why are you making them? “Well, then that’s the best reason of all,” her mom replied. “I hope there’s big money in Los Angeles for little linen squares,” her dad said. McKillen’s mother was a devout Catholic with a deep spiritual faith, but after the church’s sexual abuse scandal, she stopped going to Mass. She couldn’t bear to look at the priest’s face. 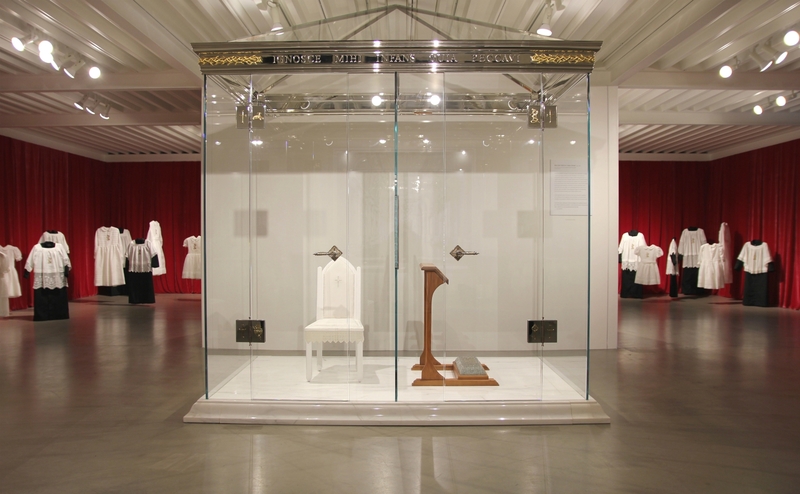 Forgive Me Child for I Have Sinned is McKillen’s life-size, transparent confessional installation piece. Meticulously designed and crafted out of glass, marble, wood, linen, metal, and nickel-plated composite, it welcomes light into a space that is traditionally dark. Instead of a seat for a priest, there is a small white chair suitable for a child. In this confessional it is the priest who is expected to kneel, confess, and ask for forgiveness. Every detail has significance. 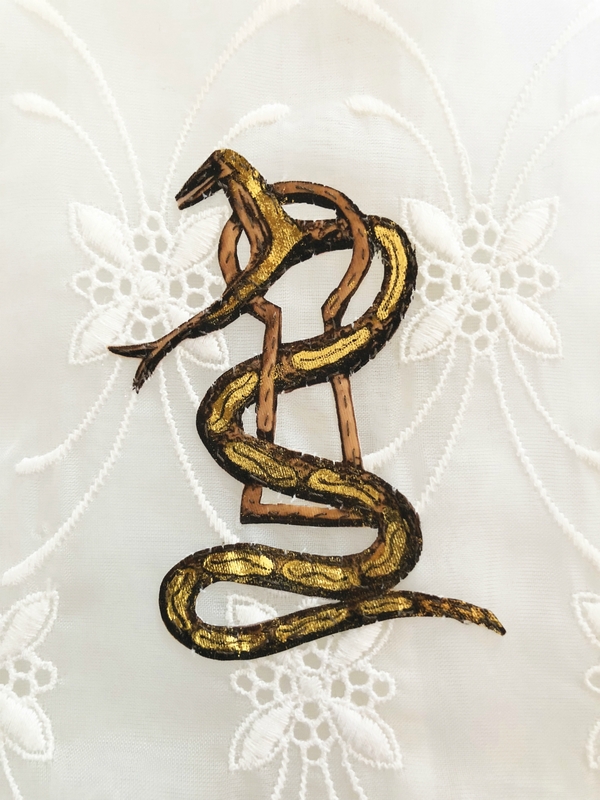 Ornate door handles read “SHAME” and “BETRAYAL.” To embellish the hinges on the confessional doors, McKillen used clay to hand sculpt a sacred heart, lamb, cross and her own original symbol—a keyhole with an entwined snake—before casting them in brass. That same keyhole-and-snake symbol, a metaphor for the evil of sexual abuse, reappears elsewhere in the exhibit. 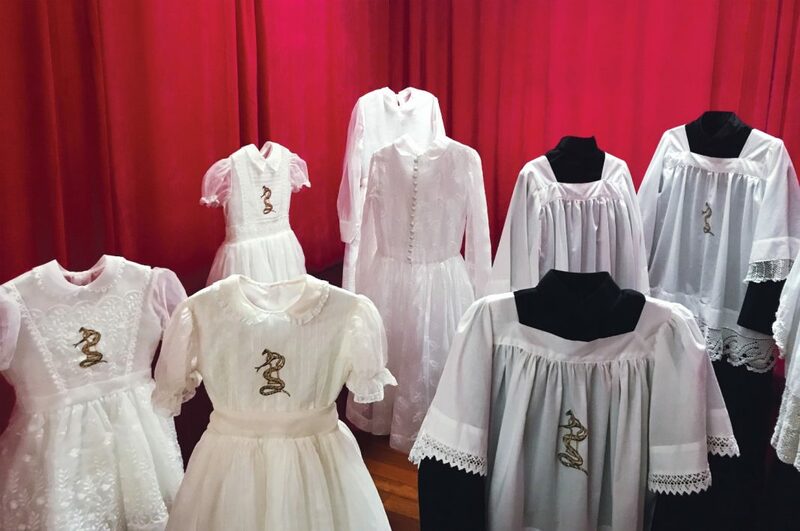 In The Children, a collection of 40 white communion dresses and altar boy vestments, the symbol is embroidered with gold leaf on the front of the garments. Over the last decade, McKillen used eBay and Etsy to source and collect these small white garments from around the world. A real little girl in France, England, or Ireland once wore each communion dress, and McKillen documented the story of each. Likewise, the elegant lace that embellishes them was collected from Russia, Belgium, China, and Australia. Most of the vestments were hand sewn by McKillen and her studio assistant using Irish linen, a nod to McKillen’s aunts who worked in linen factories in Northern Ireland. 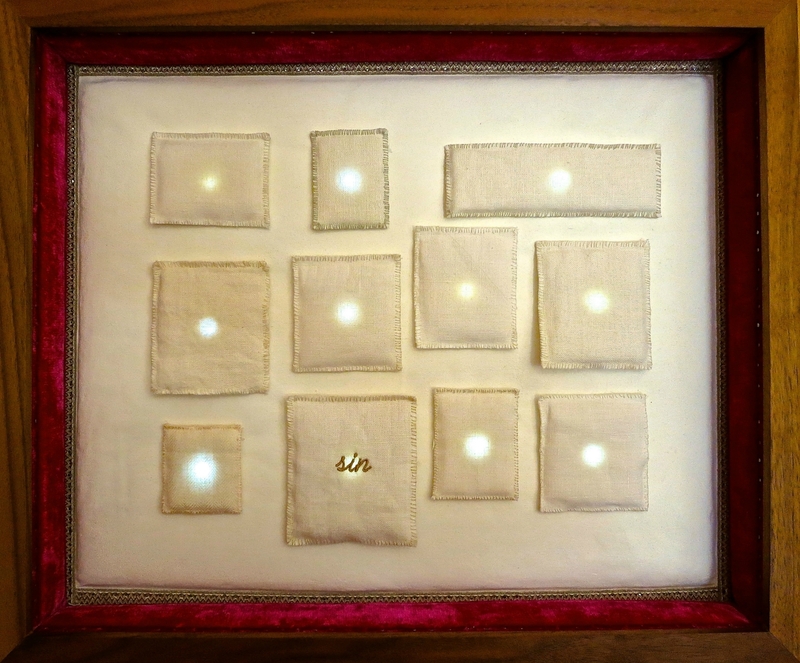 McKillen’s linen squares are now backlit and framed, appearing here as The Stations of Hope, a series of 14 intimate pieces that abstractly allude to the Stations of the Cross. When she was young, the Stations of the Cross disturbed McKillen with their gory depictions of Jesus’s blood and pain. Here, the hope and purpose the artist found during the process of creating these pieces emanates from the work. Tenured LMU English professor K.J. Peters and Laband Art Gallery director Karen Rapp were convinced that their Catholic campus was exactly the right location for this show. The duo took campus decision-makers to see the work, and everyone who encountered it agreed. This is artwork that arises out of love for the church, not a desire to disparage it, and it is necessary and important to engage with its subject. In a way, McKillen made this artwork specifically for this audience. Confess: An Installation by Trina McKillen opens Sat., Jan. 19, and runs through March 23; Laband Art Gallery, 1955 Ignatian Circle, Loyola Marymount University, Westchester. Previous articleAre We Safer Than When the Northridge Earthquake Shook L.A. 25 Years Ago?